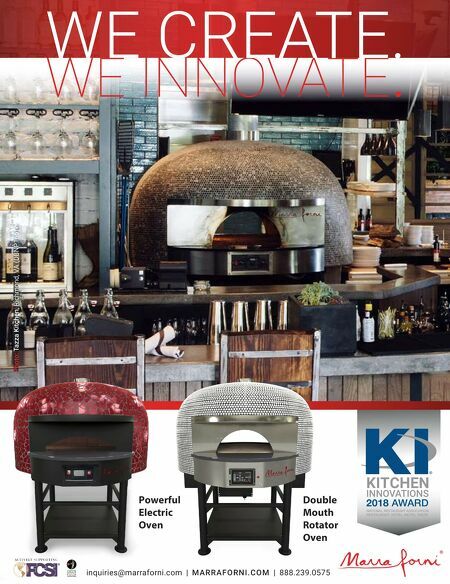 88 • FOODSERVICE EQUIPMENT & SUPPLIES • SEPTEMBER 2018 market spotlight The Barber Co. assisted Passariello's in setting up two point-of-sale platforms to handle the chain's high volume. This allows the operation to handle both dine in and delivery orders on one system. Staying True to the Culture It's not just fast-casual concepts changing the face of Italian in the U.S. Trattoria Marcella provides a unique take on Italian fare in St. Louis. Brothers Steve and Jamie Komorek opened the restaurant in 1995, then switched locations in 1998 and now operate in a space double the size of the original site. The dining room now seats 180, plus 24 on the patio and 18 at the bar. The two grew up in an area with many Italian Americans and, although not of Italian heritage themselves, felt a con- nection to the food. Steve says he wanted to try a different approach than the many Italian restaurants in the area. The restaurant's first location started with rustic, regional Italian food from central Italy that retained an Italian American flair, but when that didn't catch on, the brothers changed locations and altered the menu with the more traditional red sauce- based Italian food familiar to Americans. Handmade pasta supports the bulk of the menu. A top seller is the risotto with lobster, wild mushrooms and spinach, even though it's not on the menu and only made by request. "During our last expansion, I was in- vited into a program for chefs from abroad to visit Italy and see how food has been influenced by the surrounding regions," says Steve. "It was eye opening digging into historical dishes and gave me a better picture of what we're eating." 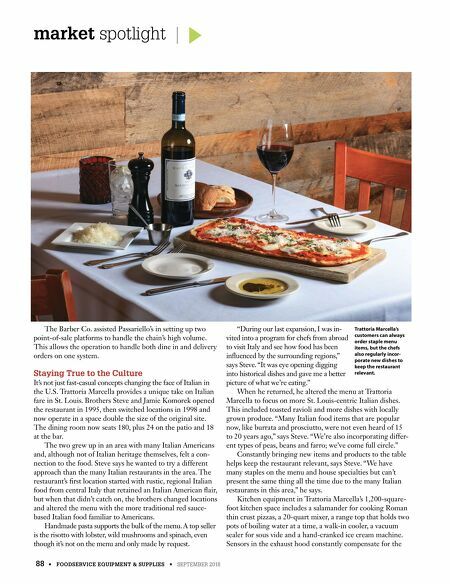 When he returned, he altered the menu at Trattoria Marcella to focus on more St. Louis-centric Italian dishes. This included toasted ravioli and more dishes with locally grown produce. "Many Italian food items that are popular now, like burrata and prosciutto, were not even heard of 15 to 20 years ago," says Steve. "We're also incorporating differ- ent types of peas, beans and farro; we've come full circle." Constantly bringing new items and products to the table helps keep the restaurant relevant, says Steve. "We have many staples on the menu and house specialties but can't present the same thing all the time due to the many Italian restaurants in this area," he says. Kitchen equipment in Trattoria Marcella's 1,200-square- foot kitchen space includes a salamander for cooking Roman thin crust pizzas, a 20-quart mixer, a range top that holds two pots of boiling water at a time, a walk-in cooler, a vacuum sealer for sous vide and a hand-cranked ice cream machine. Sensors in the exhaust hood constantly compensate for the Trattoria Marcella's customers can always order staple menu items, but the chefs also regularly incor- porate new dishes to keep the restaurant relevant.